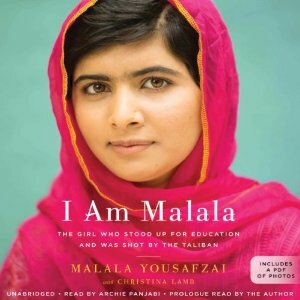 I am Malala is Malala Yousafzai’s memoir about her time in Pakistan promoting education for girls. She begins by discussing her family – from her grandparents, to her parents, and then to herself. She discusses the major political and geological forces that impacted her childhood and led up to her eventually being shot by the Taliban. She finished the book talking about how she felt when she awoke in England not knowing what had happened or where her family was. It is truly an amazing story. While listening to the book, two things occurred to me. The first is that the tone was a bit naive and honest in the way only a child can be. The types of things she observed, for instance, like how much or less attractive someone was than herself. Their skin color, etc. I realize these things are thought about by adults, but the innocent way she brought them up was darling. I also felt that the way she talked about her competition for being first in class was cute. In an adult that would seem like a lack of humility if talked about with such frequency. But in her, it was sweet. It also occurred to me that the writing was much too fleshed out to be entirely written by a young teenager. There was some obvious journalistic questioning going on before writing the book – and that is to the benefit of the story, and clearly the work of Christina Lamb. I found the political commentary interesting, especially since I’m only somewhat educated on the subject. The commentary obviously didn’t have the powerful understanding shown in a book like The Kite Runner, by Khaled Hosseini but it showed that Malala was quite intelligent and observant. It was interesting hearing those events from the eyes of a child. As long as I’m comparing the book to fiction, it reminds me somewhat of In the Country of Men, by Hisam Matar in the sense that it is about “adult” events narrated from the eyes of a child. Of course, there are three major differences: location, fiction/non-fiction, and the age of the author. But still, I think it’s an interesting comparison. I was surprised to hear how socially active Malala was before she was shot. I assumed the story was about a girl who became active only after she was shot – in other words, that the bullet was random, and that it gave her an opportunity to speak out. But, no, she was from a “privileged” environment (at least at the end) and was shot because she was speaking out. I wouldn’t be as brave as Malala, nor do I think I am as intelligent as Malala. If I were her parents, I would support her doing whatever she felt was best. That’s what my parents always did with me. It’s a great way to let a child grow into her own. I do not usually read memoirs – not sure why, I just tend to gravitate towards the heavier non-fiction. But this book was pretty fascinating for me. Malala was so intelligent and perceptive. I loved her voice. (I don’t mean the narrator’s voice, though she did a lovely job.) This book makes me want to read more memoirs. I would normally give this book 4 stars for writing and interest level, but since it’s such an important topic, it gains an extra star. Great commentary Rachel, I really like the style of your post. This is obviously a really important book. I think that I would get a lot out of it. I will at least see the film. As for some of the content clearly not being written as someone as young as Malala, at least they acknowledged Christina Lamb's role. Thanks Brian! Yes, it is an important book. I answered in this format because Doing Dewey gave us a list of questions to answer. Though I've been wondering if a bullet format might be better for the reviews. People just don't like reading paragraphs on blogs anymore. I hear the rage is bullet points. I have mixed feelings about the tone of the book! I agree with you that Malala's naivety and honesty were appealing, but I also found the childishness took away from my enjoyment of the book at times. Yeah, I can see where it would bother you. It probably sounds a lot better in the children's format.